Homemade Cocoa (From My Childhood)! My mom canned, gardened, sewed and created our life from scratch when I was growing up. 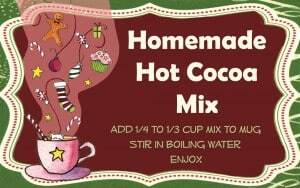 However, one of my favorite sweet “instant” indulgences during the cold, snowy winter was the instant cocoa mix she made. She’d throw all the ingredients into a big Tupperware bowl with sealed lid and shake the contents to stir them. The resulting cocoa would put any instant cocoa to shame (and even the non-instant kind)! It makes a great, super easy gift that even children can make (and enjoy). Stir together and store in an airtight container. To enjoy a steaming mug, fill mug 1/4 to 1/3 full with mix, add hot water and stir (adjust to taste). Add powdered Cinnamon, Ginger, Vanilla or even a bit of Cayenne Pepper to the mix. Or add a flavored creamer instead of regular. Package the cocoa in canning jars, recycled food jars, brown lunch bags (with an inner plastic bag), etc. One year I packaged it in pint-sized paint cans (you can buy them unused at the paint store for about a dollar each)–I used food grade bags to hold the cocoa and stuck the mix inside the cans, with label and instructions glued to the outside of the can. Here’s some labels you can use for your cocoa mix (see above for what they look like). They’re a free download you can print up on your computer.